A Geisha's Dream (Ruffage Remix)'s jacket. 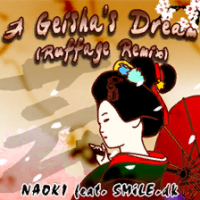 A Geisha's Dream (Ruffage Remix) is a remix of A Geisha's Dream, from DanceDanceRevolution X. A Geisha's Dream (Ruffage Remix) uses the original A Geisha's Dream's banner and charts in DanceDanceRevolution S.
A Geisha's Dream (Ruffage Remix) appears as downloadable content for DanceDanceRevolution S+, in the Hyper Japanesque Pack. It received its own banner in DanceDanceRevolution S+. It received a different set of charts in DanceDanceRevolution (2010). A Geisha's Dream (Ruffage Remix) received a new set of charts and a unique video in DanceDanceRevolution (PS3). A Geisha's Dream (Ruffage Remix) was one of the playable songs at the dance-off minigame in the KONAMI Penthouse, a virtual space in PlayStation 3's PlayStation Home. This page was last edited on 12 March 2019, at 21:58.